Pure Goats Milk Soap at SCR!! WOW! This soap is AMAZING!! We have partnered with Dragonfly Whispers Bath Works, a local Indiana Goats Milk Soap maker and are now offering samples of their products at the Sugar Creek Retreat cabins. If you’ve never tried goats milk soap, this is what the owner says about her products. Thank you Joyce for an Amazing product that our guests will absolutely LOVE! We just want to take a moment to THANK EVERYONE who chose Sugar Creek Retreat for their vacation destination this past year. We are truly humbled as blessed to be a part of such a beautiful place. We’ve sent out a guest appreciation email with a coupon for the upcoming season so double check your spam folder if you didn’t receive. Happy Holidays from the Sugar Creek Retreat Welcoming committee! All 31 covered bridges are within 15 minutes from the Sugar Creek Retreat! No matter what time of year you visit there is always beauty to be found. The intention of this weekend is to enliven and celebrate our Divine Femininity. We will connect with the gifts of nature and the practices of yoga, meditation, chanting and dance to honor both our individual and collective strength, beauty and wisdom. Join Matece for this empowering and uplifting weekend of sisterhood. Be delightfully immersed in connection with self, nature and community. Together with other supportive women in the peace of nature: share you stories, your wisdom, your laughter. Each day we'll practice yoga and dive into our breath, we'll sit in stillness and listen to the voice within, we'll have time for personal reflection as well as community sharing. The Sugar Creek Retreat is surrounded by thousands of acres of pristine wilderness. You can walk right into Shades State Park and Pine Hills Nature Preserve for unspoiled beauty and hiking or take a short drive to Turkey Run State Park or Raccoon Lake. – Ample time to hike, journal, contemplate, unwind, relax and make new friends! Restore and Explore at SCR! RESTORE AND EXPLORE . .
JOIN US FOR THIS AMAZING RETREAT! YOUR ACCOMMODATIONS ARE SURROUNDED BY NATURE! The Log Cabin and Farmhouse cottage are surrounded by thousands of acres of pristine wilderness. You can walk right into Shades State Park and Pine Hills Nature Preserve for 6,000 acres of unspoiled beauty and hiking. Star gazing and bird-watching are highly recommended! The farm house has an open field and a huge garden! *The Rustic Log Cabin can accommodate 8-10 people in three bedrooms with a modern kitchen and two updated baths. For this retreat we will limit the number to 5-6 people in the log cabin. There is a cozy fireplace, yoga loft, wrap around porch, and a large 24 x 24 patio for lounging and stargazing in one of the darkest spots in the Midwest. *The Farmhouse can accommodate 8 people in 2 bedrooms with a modern kitchen and two full baths. For this retreat we will limit that number to 5-6 people. There is a gorgeous wood burning stove and a 16 x 12 screened porch with plenty of room to stretch out. If the these two spaces fill up we will add one more huge old farmhouse to accommodate 5-7 more people! After that, we are full so don't wait to get your application in! We will also have access to a yoga pavilion with beautiful evening lights and draping to keep the bugs at bay! Each day will begin with optional yoga, breakfast, hiking, exploring or just relaxing in the beautiful setting. We are watching the weather for our special meditative walk (Shinrin-Yoku) and exploration of edible and medicinal wild plants led by the knowledgeable Naturopathic doctor Gabriel! Turkey Run State Park is nearby for those who want to venture out. Each evening will wind down with relaxing yoga after dinner and a beautiful campfire to sit around with friends and new acquaintances. Wondering about Meals???! Of course you are! ~Friday evening we will have a pitch-in dinner at the Log Cabin. ~Saturday and Sunday breakfast will be in the two separate kitchens at each place with your hostess, Marla providing 2 dozen eggs and a fresh loaf of bread for each kitchen and you can provide the rest. ~Lunch on Saturday will be at each separate kitchen and will basically be a pitch in. ~Saturday dinner we will be treated to a catered healthy vegetarian dinner by the talented owner of the retreat, Liza. She will prepare the dinner and even clean up afterwards so we can continue soaking in our surroundings! ~Sunday lunch will be prepared by Liza and we will help ourselves to the bounty and clean up afterwards! If you have special dietary needs please bring some of your own special items to make sure your meals are enjoyable and sustainable for you. There will be freedom to take advantage of whatever you desire! For more information, click "BOOK NOW"
Please note that all payments are final due to the nature of this booking. Everything has to be reserved several months out so if you need to cancel you have the option of finding someone to take your place but unfortunately, there will be no refunds. If you have any questions please click here to contact Marla directly. Copy of Peace through yoga retreat at SCR! Retreat to nature for restoration and self-compassion. We will practice yoga, meditation and other techniques, share meals, spend time among good company and nature ourselves to bring a shift to old thoughts and habits. Isn’t it time to relieve yourSelf from what prevents you from living life fully? As you shed the old and discover your own True Nature, the compassion you show yourself is what will inspire others in your life. There is no better place for this kind of work than in the cradle of Nature. You needn’t travel far to find the perfect haven your heart craves. 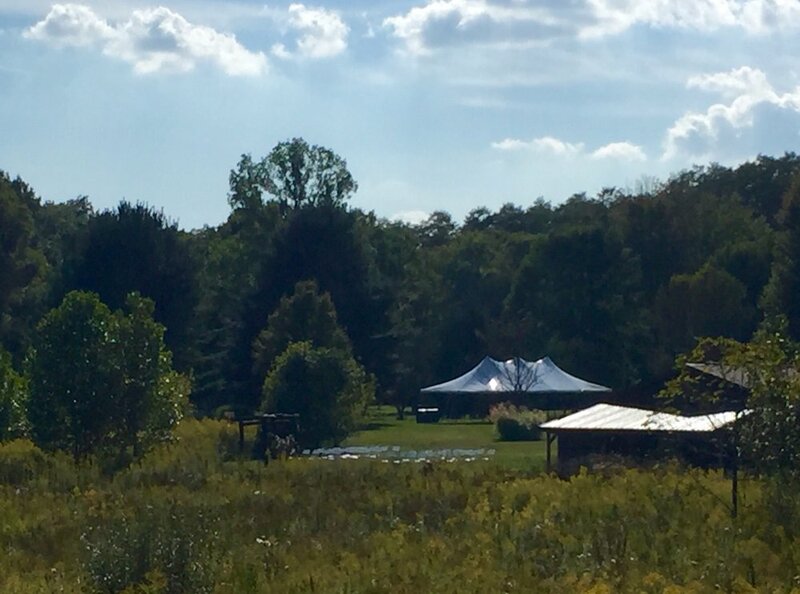 Less than one hour from Indianapolis, we have found a small retreat center on the banks of Sugar Creek nestled mong thousands of acres of magnificent forest. Here is where we will Nurture Our Nature! Two cozy cabins- Immaculate and fully equipped with kitchens, bathrooms, fireplaces and the comforts of home - will house our group as we settle into the rhythms of Nature and explore practices to nurture our well-being. Our retreat includes daily meditation, yoga and Nature walks, as well as discussions, vegetation meals and time for personal reflection. Other activities include yoga nidra, crystal signing bowls, bonfires and more! Anxiety is a problem for all of us, but it seems to be on the rise in adolescents and teens. They are experiencing a changing world with their own changing bodies and minds. It’s a tough time of life. About 3 million teens ages 12 to 17 had at least one major episode of depression in 2015, according to the Department of Health and Human Services. Studies show that 15 to 20 percent of adolescents and children suffer from anxiety disorders. However, experts think these statistics are not a true representation because many people don’t seek help for mental health issues. The numbers are increasing, and experts aren’t sure why. These teens come from the post-9/11 generation, who were raised in a time of economic instability. Social media connects them to people they may not even know, and they can take on the emotions of others easily. Teens are also struggling with the pressures of high school, which can be high. They have to deal with ever-increasing school demands, along with the pressure of trying to fit in. Then they have to worry about what happens after high school and how to get ready for that academically and socially. Moving can also add an extra layer of stress for your teen. Some adolescents -- particularly introverts -- can experience issues later in life, according to some studies. And it’s worse in those going through puberty because their lives are already fraught with changes. But there are ways to help ease some of the stress your teen might endure. Don’t keep it secret. Not telling your child about a move will add more stress. He or she already knows something is up, and not telling will cause anxiety. Talking about it early will give him or her enough time to process the information. Talk up the positive. Remind your child that the whole family is moving, along with all pets and possessions. Tell him or her about the great things near your new home, such as parks, playgrounds, attractions or new friends. Also, emphasize the things that will stay the same, such as routines. Recommend a journal. A journal is a great place for a teen to write about the move and understand his or her thoughts. If your child isn’t into journaling, try a scrapbook. Ask for input. Don’t make all the decisions yourself. Asking his or her input on locations, homes, schools, etc., will make him or her feel included and that their opinions matter. Let them say goodbye. Make sure they have time to say goodbye to their friends and teachers. Ask them how they want to say goodbye. A party? A sleepover? A pizza dinner with friends? It will help them get closure. Get them involved. Ask him or her to pack up their own room or help their younger siblings get organized. Give him or her some responsibility to show that you trust them to play a role. Set up his or her bedroom first. This sets up his or her safe haven and allows him or her to get used to the room. Letting him or her choose the look also helps. Pick out paint colors and decor with him or her to give ownership of the new room. Allow adjustment time. Plan some exploration time so you and your kids can get to know the area. Also, encourage him or her to join clubs and sports teams that he or she enjoyed at the old home. It will ease the transition and help him or her make new friends. Listen. Remind your child that his or her emotions are normal and accepted, and listen to what they are saying. Hearing your child reminds him that you care how they feel. Take care of Your Body and Soul at Sugar Creek Retreat! Sometimes we feel the need to escape from everyday life, to let go of our routine and responsibilities. This can be particularly true for older adults and seniors who may be struggling with personal or health problems and have a more difficult time getting away. A yoga retreat at Sugar Creek Retreat can be a perfect way to de-stress and recharge spiritually, mentally and physically. The benefits of a regular yoga practice for seniors, even just one gentle class a week for a couple of years, are many and seem to be long term. Yoga can keep you feeling young and relieve pain and stress as you age. Yoga is also particularly beneficial in fighting fatigue and positively impacting energy levels, general satisfaction and life purpose. Yoga is effective in the treatment of chronic fatigue symptoms relating to anxiety and depression. Yoga can also reduce symptoms and improve overall wellness for seniors suffering from chronic illnesses such as arthritis or joint inflammation. Yoga breathing practices, for example, have been show to decrease stress, which exacerbates joint pain. Furthermore specific poses can help strengthen joints while making them more flexible. While regular yoga practice is incredibly beneficial, a short but intense yoga retreat can be just as effective. A retreat gives you the perfect opportunity to disconnect from a stressful lifestyle and rediscover yourself in a completely different way. Immersing yourself in nature instead of taking a class in the city can have healing and rejuvenating effects, as being close to nature reduces cortisol production, known as our primary stress hormone. This in turn helps reduce stress levels, while the beautiful surroundings and the clean air provide relief from anxiety and respiratory problems. The famous spiritual leader Jiddu Krishnamurti also stressed the importance of retreats: "I think it is essential sometimes to go into retreat, to stop everything that you have been doing, to stop your beliefs and experiences completely and look at them anew, not keep on repeating like machines whether you believe or don't believe. You would let fresh air into your minds." Why Choose Sugar Creek Retreat? 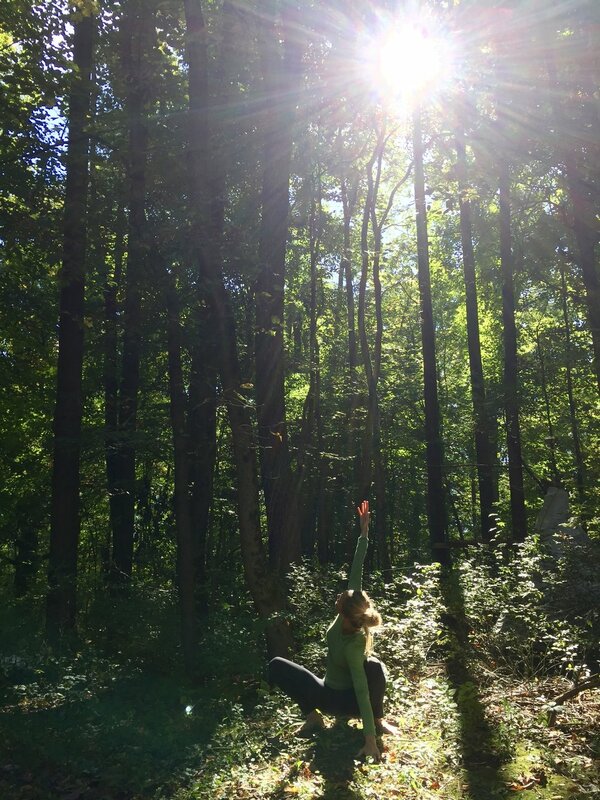 Sugar Creek Retreat is immersed in nature and surrounded by two state parks, making it an ideal location for yoga retreats. There are many beautiful and scenic places to practice, such as rivers, open fields, forests and canyons. There are also miles and miles of hiking trails, allowing you to take long slow walks in the forest and experience the invigorating benefits of nature. We are nature's creatures and our bodies can greatly benefit from the healing powers of the forest. With a varied range of accommodation and wellness weekends which include not only yoga but also herbal detoxes, nutritional and life counseling, wild plant walks and raw food workshops, you will surely find your ideal way to destress and get in touch with your best self here at Sugar Creek Retreat! SCR has been featured by a national travel writer!! A retreat venue needs to be able to give people something special - the feeling of being able to switch off, to have a different focus, to be full of energy or to take time out to rejuvenate. To spend time on their own or to spend time with family. To be away for a day, a week or a weekend. Whilst the type and nature of any retreat can vary, there needs to be a powerful sense of spirit and tranquility in the physical elements of the environment, and a sense of timelessness in the land. For some people a retreat is as much about a holiday as it is about going somewhere for physical renewal of the spirit, and good retreat centers will operate in such a way as to give people the freedom to choose at what level they want to engage with other people, and to what extent they simply want solitude. Sugar Creek Retreat does just that. It gives people the land, the buildings, and the choice of how they want to spend their time. Set in 6000 acres of stunning Indiana country, there are three different retreat centers, all surrounded by rivers, canyons and deep silent forests. All three retreat centers have their own unique charm and character, and all offer differing levels of solitude and access to nature. The Log Cabin – has three bedrooms, two bathrooms and a modern kitchen, and can sleep 8 – 10 people. There is a snug indoors with a warm inviting fireplace, a yoga loft, a wraparound porch and a huge patio. The Farmhouse – has two bedrooms, two bathrooms and a modern kitchen and can sleep eight people. It has a stunning wood-burning stove which gives it a real sense of intimacy. There is also a good size screened porch which provides a degree of privacy if needed. The Maples Farm - has three bedrooms, two bathrooms and a remodeled kitchen, and can sleep 11 people. The land immediately surrounding the center is especially beautiful and is literally minutes away from the entrance to Shades State Park. Nature and the power of the land are a key element in most types of retreat, whether structured or unstructured, directed or self-directed. Not only does the land provide a backdrop for whatever the retreat is offering, there is a special energy that comes through the combination of land, river and mountains. This energy tends to reflect itself in the overall sense of calm and relaxation that form a key part of all retreats. Many people will view a retreat in a spiritual context, although not necessarily associated with any specific type of religion or belief. The word spiritual obviously means different things to different people, but there is a sense that a retreat of any type can help people connect to their inner world in a way that is much more difficult if not impossible in normal day-to-day life. Many people believe that nature and the power of nature is an integral part of their own spirit, and for them, the way that nature interacts with the environment and with other people is a crucial element of being on retreat. For people who want to use nature as a key part of their retreat experience, Shades State Park and Pine Hills Nature Reserve are all within easy walking distance and offer a stunning opportunity either for leisurely walks or those wanting a hike. Turkey Run State Park and Raccoon Lake are also both a short drive away. Many week-long and weekend retreats do have an element of structure to them, often with a particular focus on yoga and meditation. These elements of the retreat are normally introduced very gently and provide an opportunity to try different ways of experiencing some inner peace and serenity. This type of retreat is designed for anyone with any level of experience of yoga, or none at all, and will be offered in an encouraging and supportive atmosphere. The retreat center is also able to offer a range of therapies and workshops that focus on selective areas of self-healing and development. These retreats come under the collective name of 'wellness weekends', and include practices such as nutritional and life counseling, herbal detoxs, wild plant walks and raw food workshops. Sugar Creek Retreat can seem a million miles away from any type of corporate world or corporate people, but what it can offer to people who live or work in high stress occupations or businesses cannot be overstated. A retreat is not simply an opportunity to escape the pressures of day-to-day life, it is also about creating a space where people can focus on specific issues and resolve complex problems, in an environment that generates the peace and solitude needed to do so. A retreat can provide a balance between relaxation, rest and renewal, and the power of the land is felt by many to be the driving force behind this sense of spending time being both comforted and challenged. First sunset at the pavilion!! The pavilion is finally complete! It's a 20x40 made completely from massive rough sawn cedar timber with a smooth tongue and groove floor. It measures 16' from floor to ceiling and it truly feels like magic inside. The sunrise and sunset shine through the gable peaks and illuminate the space beautifully. The space is wondefully suuited for yoga, corporate outings, family or Veteran's reunions! We can sleep a total of 28 comfortably so contact us today to check availability!! Check out the Maples Farm at Sugar Creek Retreat!! --Built by Civil War Colonel Joel Deer in the late 1870s, Maples Farm appears to be constructed entirely from lumber cut locally, and likely finished at Deer Mill, a family-owned sawmill on Sugar Creek which is still memorialized by the Deer Mill covered bridge. During a complete rehab of the house in 2013, the owners discovered a hand-hewn frame construction that had no nails—just fitted slots and wooden pegs! The house was the main farmstead for the surrounding 200 acres on all sides. The evening sunsets overlooking Shades State Park are truly spectacular! Check out Sugarcreekretreat.com/maplesfarm to learn more! Check out our Yoga programs for summer 2017! We are offering 2 distinct Yoga packages this summer. Yoga and Wild Food is a 4 day 3 night all inclusive program that includes Yoga, all Meals, ShinRin-Yoku, Wild food classes, Allergy testing, meditation and guest speakers. This program runs once a month in June, July and August. The second is a shorter weekend retreat from Friday to Sunday that includes 4 Yoga classes, meditation workshops, hiking and ShinRin-Yoku introduction. This program runs once a month from June through August. Space is limited for both so check out Sugarcreekretreat.com/yoga-center for scheduling details! SCR Yoga and Wild Food 2017 Schedule. The 2017 Yoga and Wild Food Schedule is now available. The program we have designed this year is a 3 day all inclusive resort experience that will absolutely transform your life. In 3 days you will learn basic to more intense Yoga, Breathing and Meditation techniques, Wild Food collection and preparation, Wild Tea collection and prep, The Nutritional density of food, Juicing vs Smoothie basics, Proper Vitamin Supplementation, Probiotics usage, Shin-Rin Yoku, Introduction to Earthing, and Food Allergy Testing all while lounging and relaxing among the 6000 acres of trees that surround our facility. We also have a bonfire circle each night under some f the darkest skies in the Midwest. Prices start at $600 person for 4 days and 3 nights. Add a friend and get a a 10% discount for both!! All meals are included which are a combination and plants, vegetables, eggs, fish and of course freshly made juices. Check out http://www.sugarcreekretreat.com/yoga-center for more info and booking. --A local travel paper has written the following highlighting our Lyme Education center which is one of the many things we do here at Sugar Creek Retreat! For more information please go to SC Naturopathy or contact us. 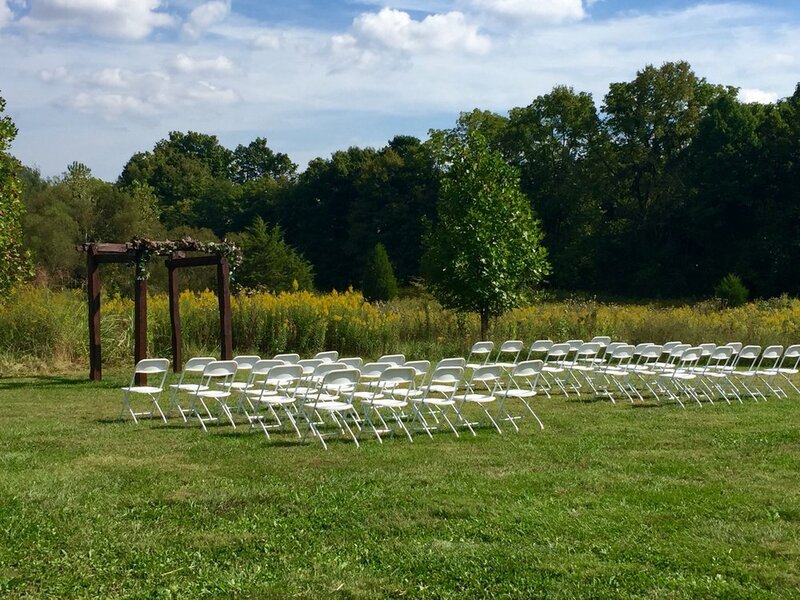 Sugar Creek Retreat, located less than an hour west of Indianapolis in Waveland, Indiana, is surrounded by six thousand acres of wilderness; you can walk off the driveway and be immersed in some of the most beautiful State parks Indiana has to offer. It is quiet, secluded and the lack of Internet connection in the woods makes it easy to disconnect from the distractions of everyday life, which is exactly the atmosphere one needs to begin healing. Gabe Fauquher, 40, is the co-owner of the center and a full-time pilot. He was also diagnosed with Lyme disease in 2011. Since then, he’s been on a self-educational journey towards health. Him and his wife, Liza, opened up the resort a year and a half ago. “We were doing nightly rentals for people who wanted to stay the night and do camping, but our big goal was always to do this as a treatment center,” says Gabe. Sugar Creek is easily accessible as a weekend destination or the 10-day wellness program they offer. The property holds a rustic log cabin and farmhouse, which sit on a 15-acre plot of land. The couple are in the final stages of building a yoga pavilion and hope to have it ready by May, where they’ll host an open house for yoga teachers, couples planning their weddings and anyone else who’s interested in checking out the space. Both Liza and Gabe have a passion for teaching, and bring different perspectives to the retreat experience. Liza is a licensed full-time psychotherapist and part-time yoga instructor and Gabe completed his doctorate in Naturopathy, focusing on food and nutrition, last October. The cost of nightly rentals for the cabin is $249 and sleeps 10 people, while the cottage is $149 nightly and sleeps 9. The cost of the 10-day retreat package, which includes all meals, lodging, support and materials for the programs is $5,000. Spouses can attend for just the cost of meals at $100 a day or an additional $1,000. Since part of getting healthy involves major lifestyle changes and is a process that varies from person to person, the center customizes programs by need with options varying from healthy food workshops about nutrition to wild plant hunting, yoga classes or life-coaching. The center is located in the outskirts of Shades Park, where you can hike, canoe or gaze over beautiful sandstone cliffs. Turkey Run State Park is within minutes as well, which has trails that vary from easy to rugged. For those who want to get out into the water, Clements, a canoe livery, is nearby and canoeing, kayaking and tubing options are available. Come to the Sugar Creek Retreat and experience the peace and serenity of one of Indiana's oldest growth forests. Pine Hills Nature Preserve is 5 feet from the cabin and has rugged hills, deep gorges and contains remnants of white pine, hemlock and Canada yew left from the time of the last glacier. It's an amazing place for Yoga and to recharge your soul. Perfect weather for a September wedding! 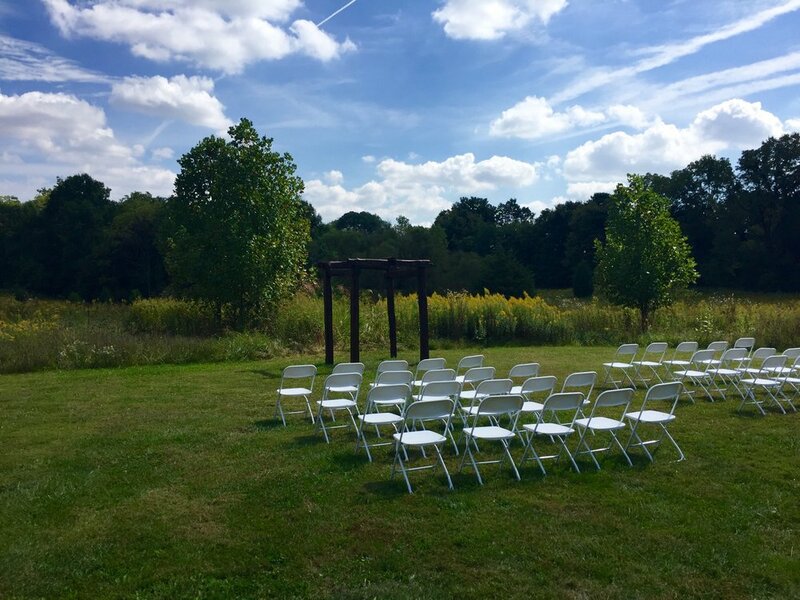 The skies were clear over Sugar Creek Retreat which made for a beautiful September wedding ceremony. Congratulations to the newlyweds! We are now able to offer 2 Wellness Packages for your stay. We have plans offering yoga and meditation and one specializing in trail running. The price is for a total of 4 people and includes a gift basket with lots and lots of all natural goodies like homemade herbs and teas, bath salts and aroma therapy oils, etc. Click www.sugarcreekretreat.com/wellness for more info! !